Today’s savvy businesses are recognizing the direct link between employee satisfaction and customer satisfaction, as well as between customer satisfaction and improved financial performance. These companies are focusing on strengthening their employee experience—and seeing impressive results in areas like retention, revenue and profitability. The employee experience speaks to the ways an organization supports and interacts with each of its employees—from the time they’re recruited until the day they leave the company. 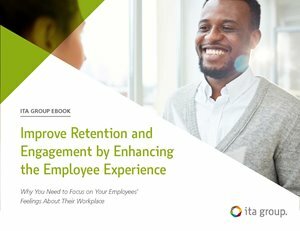 The latest ebook from ITA Group shares why you need to focus on your employees’ feelings about their workplace. At ITA Group, we create powerful results by transforming your employees into all-out advocates of your business. How? By ensuring they identify with your company, your brand and each other on an ongoing basis. We can help prioritize your employee engagement efforts and develop a roadmap for maximum impact using cutting-edge research and actual employee feedback. We design and execute solutions that will engage, recognize and unify your employees. Built with the right mix of motivators and blend of emotional drivers, our strategies fuel advocacy and drive business results. Learn more at https://www.itagroup.com.